One of the huge pleasures of visiting Israel is eating breakfast--this country takes the first meal of the day very seriously. While at home you may eat a simple breakfast of coffee and buttered toast, be prepared to eat a buffet of champions every morning when visiting Israel--helpful that your stomach will still be on a dinner schedule if you are coming from the US. A typical breakfast spread includes fresh juice, coffee, omelette or eggs of your choice, a variety of vegetable salads (the tomatoes in Israel are amazing), hummus, egg salad, olives, freshly baked breads, a huge range of cheeses both hard and soft, including the local Labaneh, and in larger hotels, add in cereals, fish (herring, smoked salmon, mackerel), yogurt, pancakes, waffles, and pastries. Hungry yet? The breakfast tradition supposedly evolved from kibbutz culture, where an extensive spread of whatever was available eaten in a communal dining hall powered the workers through long days of manual labor. As most Israeli hotels adhere to kashrut, the complex set of Jewish dietary laws, you will find no meat on the menu. And believe me, you won't miss it, even if you normally can't get by without your Full English every morning. Although you walk away stuffed each morning and normally don't have to eat again until late in the afternoon, the healthy nature of the ingredients won't leave you racked with guilt. 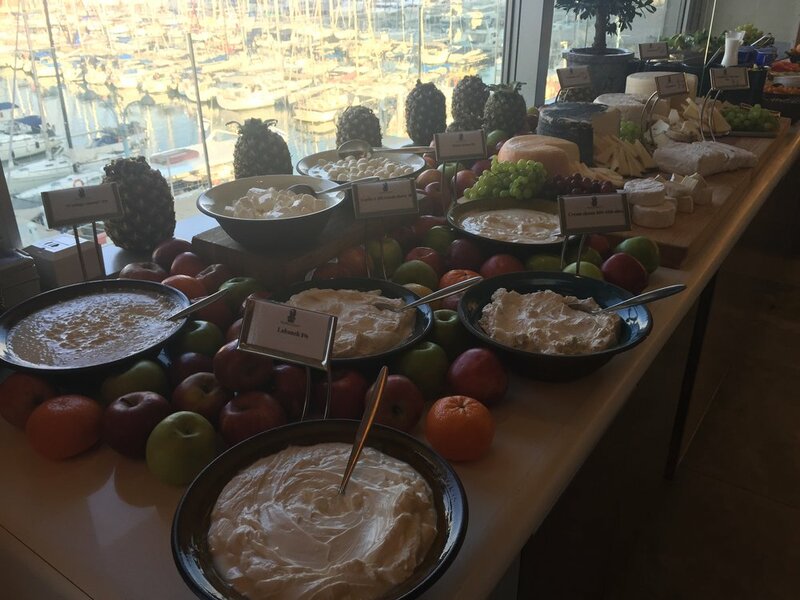 During my recent trip to Tel Aviv, we stayed at the Ritz Carlton in Herzliya, where the enormous breakfast spread was the highlight of my day. If not eating breakfast at your hotel, you will find a great breakfast menus at most of cafés dotted throughout the city, with some serving breakfast all day.